I am using OpenCV 2.1/2.3 with the newer C++ style OpenCV interface. There are a few tricky parts and changes that aren't mentioned in the cheatsheet. Hopefully the OpenCV documentation will continue to improve as it grows. Anyway, here is a quick start guide that might help beginners out. First-chance exception at 0x7c90e4ff in OpenCVHello.exe: 0xC0000008: An invalid handle was specified. This might be a bug in the OpenCV build, I don't know. You can disable it by going to Debug > Exceptions, unfold Win32 exceptions, and uncheck 0xC0000008. 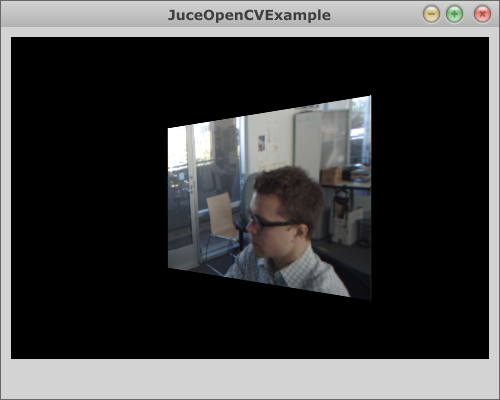 OpenCV highgui is great for experimenting. But eventually, you might want to develop a useful stand-alone program. So for this, cv::imshow and cvWaitKey are not going to cut it. See discussion at StackOverflow, Integrating OpenCV with larger programs. In most cases, there is no magic to handing off image data to other libraries. The standard container is an unsigned char array. If your image is 320x240 RGB, then your array size is 3 x 320 x 240 x sizeof(unsigned char) bytes. Since this is an unlabeled container, the consumer of this data will also need to be supplied with the image height, width, and color mode. You can initialize a cv::Mat with raw data by supplying a pointer (this assumes RGB color mode): Mat img(rawDataWidth, rawDataHeight, CV_8UC3, rawData); and later access the raw data with img.data. The only snags you are likely to come across are in dealing with row order and RGB vs. BGR format. OpenCV provides cv::flip() and cv::cvtColor() to deal with this. I have had success using videoInput library to access DirectShow devices. The library enumerates and lists friendly names of connected devices, and generally gives you more information when something goes wrong. It's much better than guessing capture device IDs, and essential if you are going to provide some camera selection to the user. Qt is a good option because Qt is great and has a big community. Open a new thread to run cv::VideoCapture in a loop and emit signal after frame capture. Use Qt's msleep mechanism, not OpenCV. So, we are still using OpenCV highgui for capture. cv::Mat frame; // object to receive a captured frame. I have a feeling this sample code, which I borrowed from this OpenGL+OpenCV tutorial, could be even simpler; I also don't like that it's using OpenCV 1.0 style structures. More on Juce/OpenGL later. i've written a guide for opencv and netbeans, for those who feel uncomfortable with visual studio. hope u check it out. Have you tried for IplImage to/from juceImage. If you have such code please post. You made my day, thanks! Hi thanks for posting this article! It helped me to be able to capture video from a webcamera which didn't work for me otherwise. I have problem to put the capture of camera in MFC (picture box). quand j'exécute le code de code source détection yeux bouche nez il mm'affiche toujours ce messages: 1>c:\users\poste\documents\visual studio 2010\projects\vendredi\vendredi.cpp(3): fatal error C1010: fin de fichier inattendue lors de la recherche d'un en-tête précompilé. N'auriez-vous pas oublié d'ajouter '#include "StdAfx.h"' à votre source ? Nice guide. I've a question "how to convert video into frames " and "How to select object from video using mouse?? ".If you have a code for this problem could you post or send mail to vinoth91.aec@gmail.com. Thanks!.. boushila: quand j'exécute le code de code source détection yeux bouche nez il mm'affiche toujours ce messages: 1>c:\users\poste\documents\visual studio 2010\projects\vendredi\vendredi.cpp(3): fatal error C1010: fin de fichier inattendue lors de la recherche d'un en-tête précompilé. N'auriez-vous pas oublié d'ajouter '#include "StdAfx.h"' à votre source ?